Almost 40 mm in length, a Nephila spider waits in its web for flying insects to blunder in. Malindi, Kenya, January 2012. Among the largest and most conspicuous of Kenya's spider, Golden Orb Weavers, also produce the strongest silk. Occasionally webs will span across roadways from trees high above. In the photo at left a small spider can be seen at upper left: this is an adult male. He might escape being eaten by the female by virtue of his near nothingness! 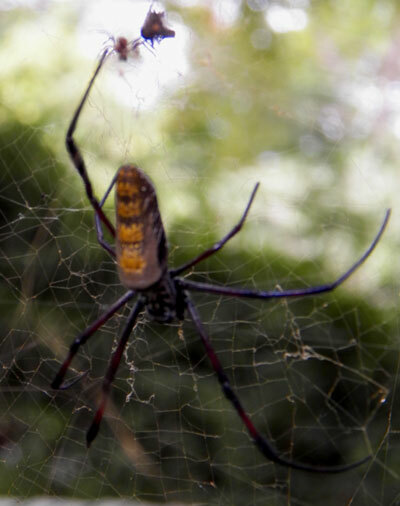 There are several species of Nephila that could be found in Kenya. Most species have conspicuously banded legs whereas this one has inconspicuous markings on the legs.